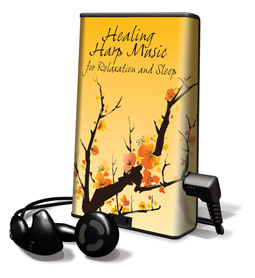 Just in time for Mother’s Day, we are excited to introduce the new PlayAway® ♦ Healing Harp Music for Relaxation and Sleep. It makes a unique gift honoring our Moms and/or any of the important women in our lives. The PlayAway® “Healing Harp Music” is a tiny audio device pre-loaded with five hours of Tami Briggs’ relaxing harp music. Click here for more information and to watch a video clip about it. The PlayAway® “Healing Harp Music” is simple to use, portable and useful in many settings, durable for repeated use, and lightweight. It comes with a battery (for immediate use), ear buds, handy storage case, and easy-to-use instructions.